Liberty High School NJROTC: 68 Cadets, 2 Instructors, and 5 parent chaperones spent 3.5 days at the NJROTC Basic Leader Training camp at the CISPUS Learning Center in Randle, Wa. The Cadets were up at 6 am and didn't turn in until 10 pm each day. 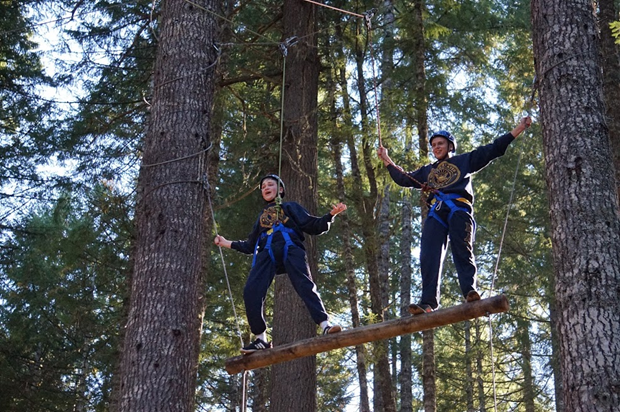 The Cadets participated in numerous activities including but not limited to: Communications and leadership exercises, physical fitness, uniform and barracks inspections, drill, homework/study time, Kitchen Patrol (KP) duty, and a high/low ropes training challenge course.